Each trip to Bryce has been different. Here is a collection of pictures taken over a 20 year period. The stuff with snow were taken in a hurry because of winter coming. It’s windy. We’re not prepared, didn’t bring any insulation. Once the storm comes in, as Bryce is over 8000 feet elevation, movement will be almost nil. So we gotta beat the storm, get some shots and get out the west side of the park where the weather is more humane. Believe me, Joe Chilly is moving freely all the way to our bones. Bryce Canyon National Park /ˈbraɪs/ is a national park located in southwestern Utah in the United States. The major feature of the park is Bryce Canyon, which despite its name, is not a canyon but a collection of giant natural amphitheaters along the eastern side of the Paunsaugunt Plateau. Bryce is distinctive due to geological structures called hoodoos, formed by frost weathering and stream erosion of the river and lake bed sedimentary rocks. The red, orange, and white colors of the rocks provide spectacular views for park visitors. Bryce sits at a much higher elevation than nearby Zion National Park. The rim at Bryce varies from 8,000 to 9,000 feet (2,400 to 2,700 m). The Bryce Canyon area was settled by Mormon pioneers in the 1850s and was named after Ebenezer Bryce, who homesteaded in the area in 1874. The area around Bryce Canyon became a National Monument in 1923 and was designated as a National Park in 1928. The park covers 35,835 acres (55.99 sq mi; 145.02 km2) and receives relatively few visitors compared to Zion National Park and the Grand Canyon, largely due to its remote location. Bryce Canyon National Park is located in southwestern Utah about 50 miles (80 km) northeast of and 1,000 feet (300 m) higher than Zion National Park. The weather in Bryce Canyon is therefore cooler, and the park receives more precipitation: a total of 15 to 18 inches (38 to 46 cm) per year. Yearly temperatures vary from an average minimum of 9 °F (−13 °C) in January to an average maximum of 83 °F (28 °C) in July, but extreme temperatures can range from −30 °F to 97 °F (−34 °C to 36 °C). The record high temperature in the park was 98 °F (37 °C) on July 14, 2002. The record low temperature was −28 °F (−33 °C) on December 10, 1972. The national park lies within the Colorado Plateau geographic province of North America and straddles the southeastern edge of the Paunsagunt Plateau west of the Paunsagunt Fault (Paunsagunt is Paiute for “home of the beaver”). Park visitors arrive from the plateau part of the park and look over the plateau’s edge toward a valley containing the fault and the Paria River just beyond it (Paria is Paiute for “muddy or elk water”). The edge of the Kaiparowits Plateau bounds the opposite side of the valley. Bryce Canyon was not formed from erosion initiated from a central stream, meaning it technically is not a canyon. Instead headward erosion has excavated large amphitheater-shaped features in the Cenozoic-aged rocks of the Paunsagunt Plateau. This erosion exposed delicate and colorful pinnacles called hoodoos that are up to 200 feet (61 m) high. A series of amphitheaters extends more than 20 miles (32 km) north-to-south within the park. The largest is Bryce Amphitheater, which is 12 miles (19 km) long, 3 miles (4.8 km) wide and 800 feet (240 m) deep. A nearby example of amphitheaters with hoodoos in the same formation but at a higher elevation, is in Cedar Breaks National Monument, which is 25 miles (40 km) to the west on the Markagunt Plateau. The Paiute Indians moved into the surrounding valleys and plateaus in the area around the same time that the other cultures left. These Native Americans hunted and gathered for most of their food, but also supplemented their diet with some cultivated products. The Paiute in the area developed a mythology surrounding the hoodoos (pinnacles) in Bryce Canyon. They believed that hoodoos were the Legend People whom the trickster Coyote turned to stone. At least one older Paiute said his culture called the hoodoos Anka-ku-was-a-wits, which is Paiute for “red painted faces”. It was not until the late 18th and the early 19th century that the first European Americans explored the remote and hard-to-reach area. Mormon scouts visited the area in the 1850s to gauge its potential for agricultural development, use for grazing, and settlement. Ebenezer Bryce and his family lived in Bryce Canyon, in this cabin, here photographed c. 1881. The Church of Jesus Christ of Latter-day Saints sent Scottish immigrant Ebenezer Bryce and his wife Mary to settle land in the Paria Valley because they thought his carpentry skills would be useful in the area. The Bryce family chose to live right below Bryce Canyon Amphitheater. Bryce grazed his cattle inside what are now park borders, and reputedly thought that the amphitheaters were a “helluva place to lose a cow.” He also built a road to the plateau to retrieve firewood and timber, and a canal to irrigate his crops and water his animals. Other settlers soon started to call the unusual place “Bryce’s canyon”, which was later formalized into Bryce Canyon. A combination of drought, overgrazing and flooding eventually drove the remaining Paiutes from the area and prompted the settlers to attempt construction of a water diversion channel from the Sevier River drainage. When that effort failed, most of the settlers, including the Bryce family, left the area. Bryce moved his family to Arizona in 1880. The remaining settlers dug a 10 miles (16 km) ditch from the Sevier’s east fork into Tropic Valley. Creation of the park Bryce Canyon Lodge was built between 1924 and 1925 from local materials. These scenic areas were first described for the public in magazine articles published by Union Pacific and Santa Fe railroads in 1916. People like Forest Supervisor J. W. Humphrey promoted the scenic wonders of Bryce Canyon’s amphitheaters, and by 1918 nationally distributed articles also helped to spark interest. However, poor access to the remote area and the lack of accommodations kept visitation to a bare minimum. Ruby Syrett, Harold Bowman and the Perry brothers later built modest lodging, and set up “touring services” in the area. Syrett later served as the first postmaster of Bryce Canyon. Visitation steadily increased, and by the early 1920s the Union Pacific Railroad became interested in expanding rail service into southwestern Utah to accommodate more tourists. Two story wood building next to flag pole with U.S. flag waving in the wind. Snow on ground. In 1928 the canyon became a National Park. It now has this visitors’ center. At the same time, conservationists became alarmed by the damage overgrazing and logging on the plateau, along with unregulated visitation, were having on the fragile features of Bryce Canyon. A movement to have the area protected was soon started, and National Park Service Director Stephen Mather responded by proposing that Bryce Canyon be made into a state park. The governor of Utah and the Utah Legislature, however, lobbied for national protection of the area. Mather relented and sent his recommendation to President Warren G. Harding, who on June 8, 1923 declared Bryce Canyon National Monument into existence. Members of U.S. Congress started work in 1924 on upgrading Bryce Canyon’s protection status from a U.S. National Monument to a National Park in order to establish Utah National Park. A process led by the Utah Parks Company for transferring ownership of private and state-held land in the monument to the federal government started in 1923. The last of the land in the proposed park’s borders was sold to the federal government four years later, and on February 25, 1928, the renamed Bryce Canyon National Park was established. The Bryce Canyon area shows a record of deposition that spans from the last part of the Cretaceous period and the first half of the Cenozoic era. The ancient depositional environment of the region around what is now the park varied. The Dakota Sandstone and the Tropic Shale were deposited in the warm, shallow waters of the advancing and retreating Cretaceous Seaway (outcrops of these rocks are found just outside park borders). The colorful Claron Formation, from which the park’s delicate hoodoos are carved, was laid down as sediments in a system of cool streams and lakes that existed from 63 to about 40 million years ago (from the Paleocene to the Eocene epochs). Different sediment types were laid down as the lakes deepened and became shallow and as the shoreline and river deltas migrated. Biology Mule deer are the most common large animals found in the park. The forests and meadows of Bryce Canyon provide the habitat to support diverse animal life, from birds and small mammals to foxes and occasional bobcats, mountain lions, and black bears. Mule deer are the most common large mammals in the park. Elk and pronghorn, which have been reintroduced nearby, sometimes venture into the park. Bryce Canyon National Park forms part of the habitat of three wildlife species that are listed under the Endangered Species Act: the Utah Prairie Dog, the California Condor, and the Southwestern Willow Flycatcher. The Utah Prairie Dog is a threatened species that was reintroduced to the park for conservation, and the largest protected population is found within the park’s boundaries. About 170 species of birds visit the park each year, including swifts and swallows. Most species migrate to warmer regions in winter, although jays, ravens, nuthatches, eagles, and owls stay. In winter, the mule deer, mountain lion, and coyotes migrate to lower elevations. Ground squirrels and marmots pass the winter in hibernation. Eleven species of reptiles and four species of amphibians have been found at in the park. Reptiles include the Great Basin Rattlesnake, Short-horned Lizard, Side-blotched Lizard, Striped Whipsnake, and the Tiger Salamander. While humans have greatly reduced the amount of habitat that is available to wildlife in most parts of the United States, the relative scarcity of water in southern Utah restricts human development and helps account for the region’s greatly enhanced diversity of wildlife. Activities A line of snowshoers with colorful rock cliff in background. 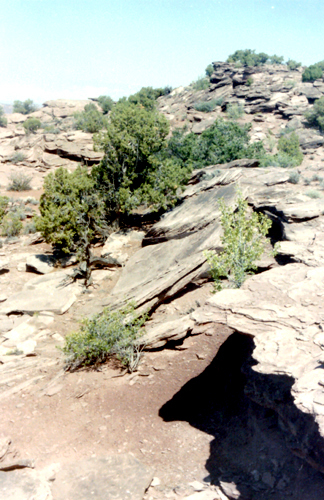 Navajo Trail. Trees are Pseudotsuga menziesii and Pinus ponderosa. More than 10 miles (16 km) of marked but ungroomed skiing trails are available off of Fairyland, Paria, and Rim trails in the park. Twenty miles (32 km) of connecting groomed ski trails are in nearby Dixie National Forest and Ruby’s Inn. The park also has a 7.4 magnitude night sky, making it one of the darkest in North America. Stargazers can therefore see 7,500 stars with the naked eye, while in most places fewer than 2,000 can be seen due to light pollution (in many large cities only a few dozen can be seen). Park rangers host public stargazing events and evening programs on astronomy, nocturnal animals, and night sky protection. The Bryce Canyon Astronomy Festival, typically held in June, attracts thousands of visitors. In honor of this astronomy festival, Asteroid 49272 was named after the national park. A favorite activity of most visitors is landscape photography. With Bryce Canyon’s high altitude and clean air, the sunrise and sunset photographs can be spectacular.